Snowshoeing in Rocky Mountain National Park! The winter months are becoming increasingly popular in Estes Park, Colorado and Rocky Mountain National Park. And for good reason! Our little corner of the rockies transforms into a winter wonderland with our quaint little village as the centerpiece with a backdrop of the majestic, snow capped, peaks along the continental divide standing high above. The wildlife moves down to lower elevations in and around town, so we see elk, mule deer, and bighorn sheep daily, among many other smaller critters. And one of the best things about it is that it's quiet! All of the crowds are jamming into the ski resorts, shelling out thousands of dollars to get a few ski runs in with thousands of other people. 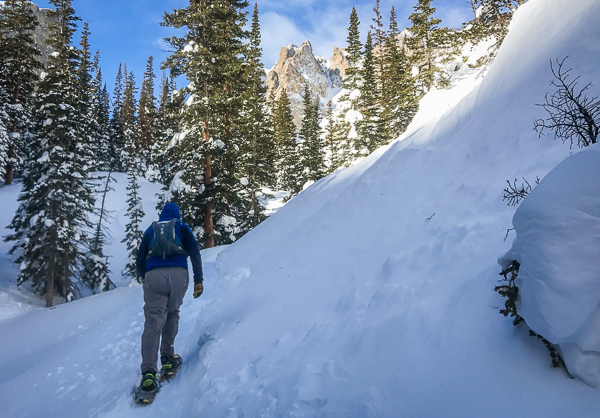 While more and more people are catching onto the serenity and solitude that Estes and RMNP have to offer, it is still far less crowded than any ski area, without question. With that, we get quite a few guests who are new to winter travel and winter activities. They are intimidated by the idea of snowshoeing in the mountains or venturing off into the wilderness with nothing more than big, funny looking, tennis racquets on their feet. Let me just say that if you can walk, you can snowshoe. It's that easy. 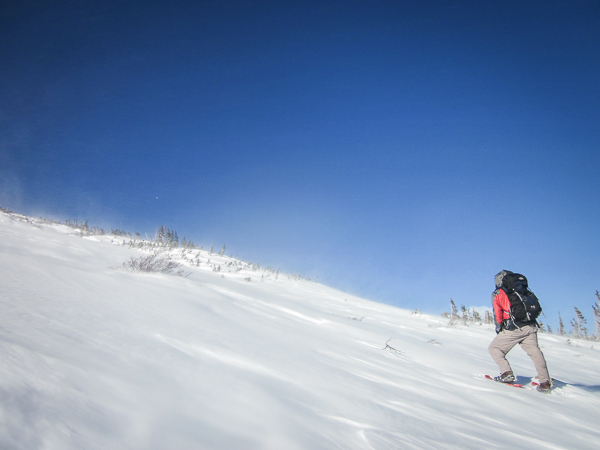 Here, we offer a few tips that can make your first few snowshoe trips even better! Sure, it may be super cold when you head out into Rocky Mountain National Park. But once you don your snowshoes and start slugging away up the mountain through deep snow, chances are your brow will be damp with sweat! Layers are key. Once you warm up and your inner layers start wicking a bit of moisture, you'll want to shed your shell or your puffy layer. Why? Try this... stop. Sit down for 5 minutes. That moisture on your inner layers will get very cold quite quickly. Now up the ante. You sprain an ankle and can't get back to your car under your own power, or you have to move excessively slow. That same cold moisture against your skin will drop your core temp faster than a toupee in a hurricane! So layer up and shed as you get warm. Sweating is for suckers. You will be heading into the backcountry. A demanding landscape in harsh conditions that can change rapidly. Be ready! Bring enough layers, water, food, etc to be able to get through a variety of scenarios. I've experienced the coldest weather of my life and also felt incredibly hot with snowshoes strapped to my feet. Water/sports drink. Prepare to hydrate! Bring enough water (fluids) for twice as long as you're planning to be out. Just in case. Sunscreen. The sun can bake your skin. Literally. Apply a generous coat of sweat resistant sunscreen and bring it along to re-apply. Sun Glasses/Goggles. Don't forget to take care of your eyes. This is simple. You'll thank yourself. Trust me. Extra Gloves. I learned the hard way. -20F at Timberline Falls. I took my gloves off to take pics and they froze solid, from the inside, in about a minute. One of the most painful experiences of my life. I *always* have a second set of gloves in my pack and they have come in handy several other times. Check the weather. This has a couple of uses. One. It can help you plan your clothing. Simple enough. Two. It can help give you a mental edge. If you know you will experience 50mph winds, you'll be ready to face them when they about rip your car door off at Bear Lake. Or, you can decide to go on a better day. On the slopes of Flattop Mountain. Much easier said than done! There are 350+ miles of hiking trails in Rocky Mountain National Park. Once the snow sets in a good chunk of those get hard to access, so it narrows it down a bit for you. But we can help fine tune which trail you end up picking depending on a few factors. The point is, you want to pick a trail that suits you. Length, difficulty level, features, etc... all play a roll. If you're a complete newbie, it's easy. Head to Bear Lake and hit the trail to Nymph, Dream, and/or Emerald Lakes. It's very easy to follow the trail and even if you only go part of the way to Emerald, it's still a spectacular outing. Plus, the scenery is classic RMNP. Differential Glaciation at its finest! The spectacular NE face of Hallett Peak and the Flattop Spires will loom above you from start to finish. Just go here. You won't be sorry! If you have a few snowshoe outings under your belt, or you want something a bit more challenging, head into Glacier Gorge to Mills Lake or the Loch. You'll pass a frozen Alberta Falls along the way which is always fun to see! Some other great options are the Wild Basin Trail and even heading up the Longs Peak Trail. If you'd like more info on the trails, give us a call or check out some of the great resources below. There is strength in numbers! Hit the trail with someone more experienced than you. This can help give you confidence and give you peace of mind as you try your hands at a new-to-you sport. You can also pick up great tips you might otherwise have to learn yourself, the hard way. In addition, it is much safer and the recommended best practice to head into the mountains with at least one other person. We are always excited to help someone discover the joys of heading out on the trails in the winter months. It's great to see folks realize that they aren't limited to getting out only when the weather is warm and the grass is green. We can help you pick out snowshoes, help you decide on what layers/gear to wear, help guide you to the right trail for you, and simply give you any tips or answer any questions you may have. Just go! Get out and enjoy the trails! 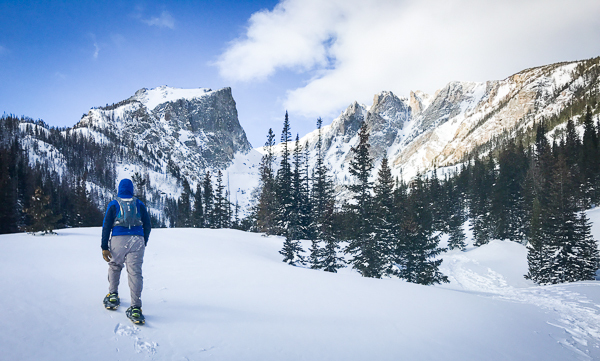 Endless adventure, beauty, and winter solitude await you when you leave the trail head and enter the splendor that is winter in Rocky Mountain National Park! Be cautious, use your head, but get out and explore the wintery scenes that await! Exploring the Sprague Lake area. 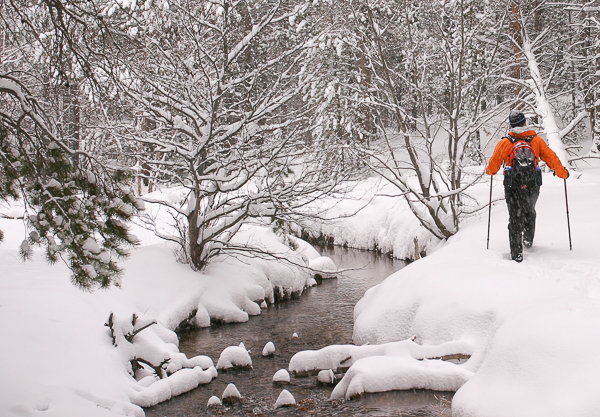 We rent snowshoes for $10/pair for your entire stay. Inquire when you check-in. Thanks for reading and be sure to share your experience with us on Facebook or in the comments below! In Tyndall Gorge near Emerald Lake.